Looking for a new breakfast idea? 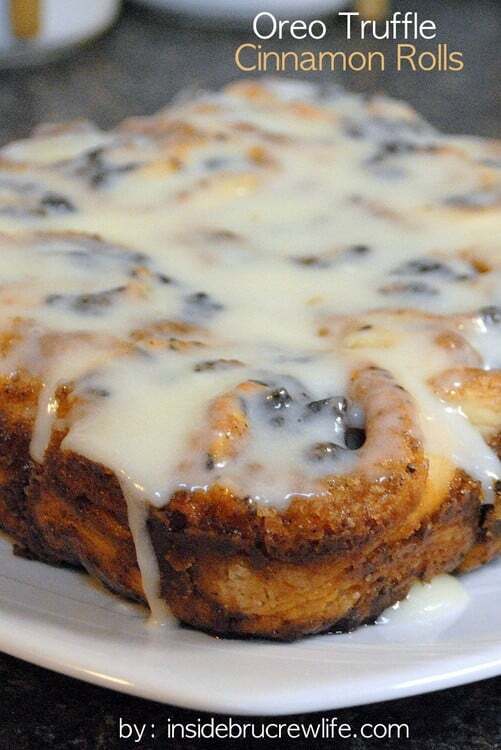 Try these Oreo Truffle Cinnamon Rolls. No yeast and ready in under an hour makes them perfect for any weekend breakfast. I am fairly certain that the word URGENT in “urgent care” is not at all the right word choice. Maybe it should have been called “let’s see how long we can make them wait” care unit. Because every time we go it takes at least an hour and a half. This time was no exception. We got there and got too excited at the prospect of an empty waiting room. 20 minutes later we were in the room…waiting…for at least another 40 minutes. Then we talked to the Dr. and waited for the nurse to come back. When your child has a fever for 24 hours and a sore throat and tonsils the size of golf balls you don’t want to wait so long. Just saying! I mean I was 99.9% sure it was strep, but I’m no doctor, so we waited!!! Ok, now that I got that out of my system, I just want to say for the record how thankful I am that we have great insurance, great doctors, and great medicine in this wonderful country! Honest!!! I seriously wasn’t complaining or being ungrateful. (ok, I might have been complaining just a tad) But I am very thankful to have an urgent care center to even go to!!! Now I do have something for you that is URGENT!!!! and needs your IMMEDIATE attention!!! 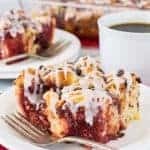 I absolutely love how easy these homemade cinnamon rolls are to make. And there is no yeast or rising time! Booyah!!! So, just to kick it up a notch I baked Oreo truffles into them!!! Oh baby! These are the bomb!!! You can thank me now for the BEST breakfast ever! What are you doing still reading??? Get in the kitchen STAT!!! 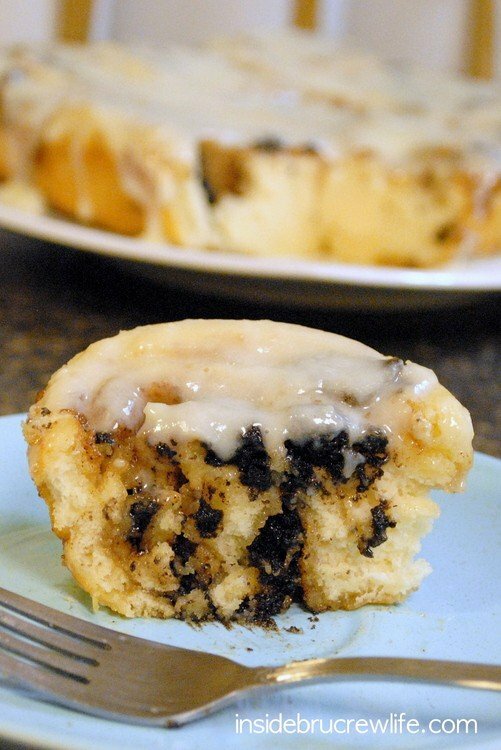 These easy no yeast cinnamon rolls are filled with Oreo truffle pieces. Delicious and fun breakfast in less than an hour!!! Combine all of the filling ingredients in a small bowl. Set aside. Beat the cookie crumbs and cream cheese until a soft dough forms. Set aside. Preheat oven to 400 degrees. Brush a 9-inch cake pan with 1 Tablespoon of melted butter. 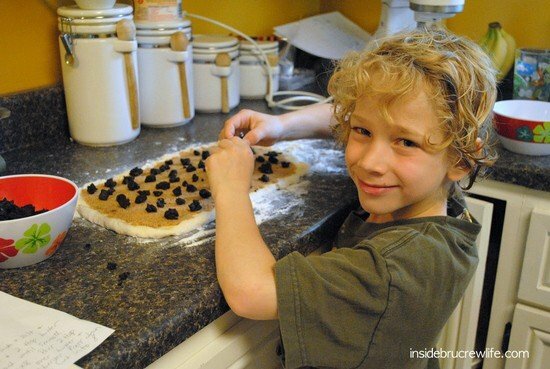 In a medium bowl, combine the flour, sugar, baking powder, baking soda, and salt. Add the buttermilk and 2 Tablespoons of the melted butter and stir until just combined. Transfer the dough to a VERY well floured surface and slowly knead. It will be extremely sticky and your hands will be covered in dough, so keep flour handy. 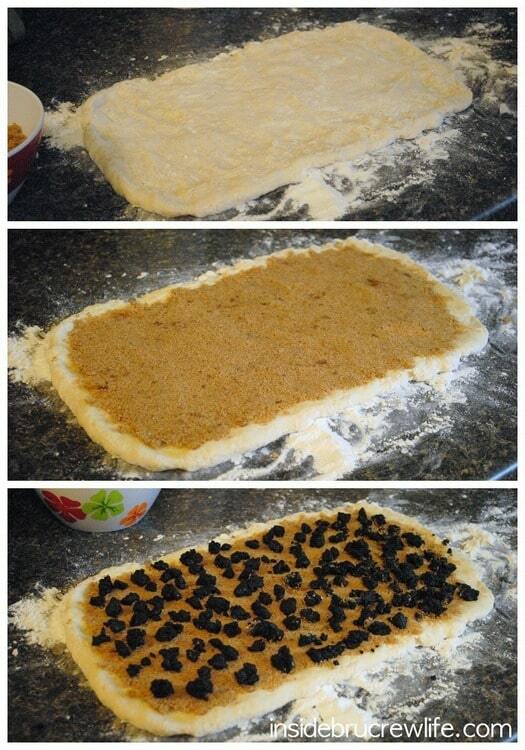 Flatten the dough into a rectangle about 14 inches by 10 inches. Spread 2 Tablespoons melted butter on the dough. Pour the sugar filling over the dough and press it down into the butter. Make sure to leave about a 1/2 inch border on all sides. Sprinkle with the Oreo truffle mixture. Roll from the longer side, pressing as you go. Be very careful, because it will stick to the counter. Use a butter knife or spatula to carefully lift under the roll as you roll. Finish rolling and lay seam side down. Cut into 9 even pieces with a serrated knife and place in buttered pan. (I also cut the ends off, to even the roll up) Drizzle the remaining 2 Tablespoons of melted butter over the tops. Bake for 20-22 minutes, until golden brown. Remove from oven and let sit for 5 minutes. Whisk together the frosting ingredients. Pour over the tops of the warm rolls. Makes 9 rolls. 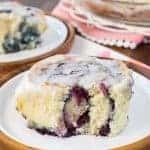 Refrigerate leftover rolls. **You can leave out the Oreo truffle mixture if you just want plain cinnamon rolls. OH my goodness. You are in big trouble lady! Er I’m in big trouble! Oh wow. My diet is in major trouble. 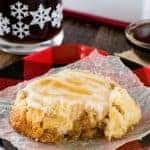 I know that I will never make these because I am a LAZY baker, but I intend on telling everyone I know about them in hopes that they will soon make them and invite me over to help eat them. How divine! Oreo truffles and cinnamon rolls? It’s insane and sounds so delicious. Hope everyone is feeling better! 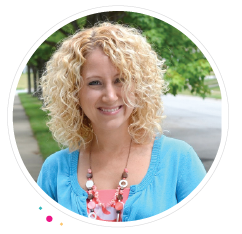 Visiting from Amanda’s Weekend Bloggy Reading Link up! 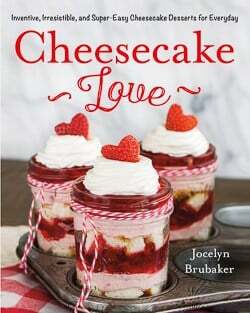 I know what Ill be baking this weekend! Those look so good! I need to get on this pintrest kick! 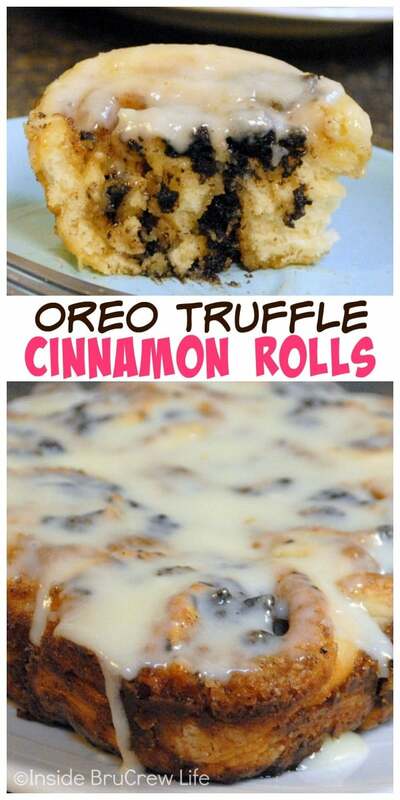 How did you know that I love Oreo Truffles…and adding them to homemade cinnamon rolls, WOW!!! 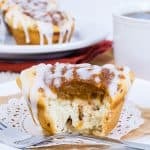 this post just gave me all the reasons why I need to bake me some cinnamon rolls asap! glad to have found your blog via Serenity Now! Brilliant! I must make these. Oreo truffles in cinnamon rolls? This must be insanely good!!!! Thanks for the recipe!!! Just found your blog. Your recipes look amazing…and too ridiculous to try too many in a row 🙂 Now a new follower! ohemgee! kill me now those look amazing! a MUST try for sure!!! Oh.my.gosh. Those look amazing! Wait til I show these to my husband! These look so very good! 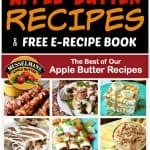 You post the best recipes and your photography is amazing. I adore Oreos. Those look amazing!!! Oh my goodness, oreos, and cinnamon rolls, a match made in heaven I would say! I am with you om the urgent care thing! Thank you so much for linking up to my first party! Oh, those look ridiculously delicious. My mouth is watering as I sit here staring at them. Thanks for sharing this one. Hello! 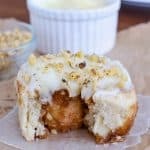 I’m planning on baking these delicious rolls within the next to days, and I was wondering, will it turn out alright if I prepare the recipe today, refrigerate it overnight, and bake them for breakfast tomorrow? @hay!…I think that would be fine. You might want to take them out of the refrigerator at least 30 minutes before baking. The cold temperature of the buns might affect the baking time some, so keep checking them!!! I just saw lemon oreos at the store yesterday. Pondering how they would be in this recipe.